The Gift of Creativity – the perfect gift for any occasion! Buy an eGift Voucher for your friend, family member, colleague or for that person you always wanted to say thank you! Whoever this lucky person is, they’ll love this gift of creativity, fun and relaxation! 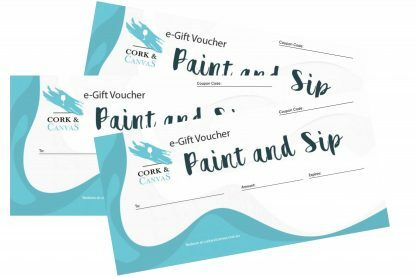 Immediately upon purchasing our eGift Voucher, a unique coupon code will be emailed to the recipient for them to use when booking their seat to any of our public paint sessions. You can fill in the recipient’s details at Checkout. 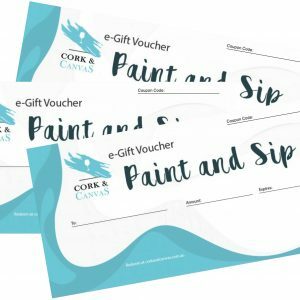 Physical eGift Vouchers: To gift in person or at a later time, email the eGift Voucher to yourself and download our printable eGift Voucher template. Write the unique coupon code you received via email on to the printed voucher. The unique code begins with “cc-“. This code is what the recipient will use at check out on our website, so be sure to write each character clearly. You can download our template by logging into your Account and clicking on your purchased order. * Please note that our eGift vouchers expire 13 months after purchase. You're viewing: The Gift of Creativity – the perfect gift for any occasion!